The legendary, beloved anvil-armed sailor of the seven seas comes magically to life in this delightful musical, starring Robin Williams as Popeye, who meets all challenges with the unshakable philosophy "I yam what I yam and that's all that I yam." Shelley Duvall is Popeye's devoted long-limbed sweetie, Olive Oyl, one of the fimiliar and loveable characters who join Popeye in his adventures in the harbor town of Sweerhaven. Meet Wimpy and Bluto and all the other cartoon favorites in this happy, tuneful, fun-for-the-whole family movie! The sailor man with the spinach can! Almost 23 years after the fact, the concept of �Robert Altman�s Popeye� still sounds odd. 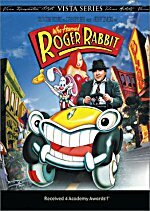 Maybe it�s not quite as weird as �Francois Truffault�s Bazooka Joe� or �Stanley Kubrick�s Little Lulu�, but the idea of Altman shooting a film based on a cartoon character did � and does � seem funky. In the back of my head, I recalled Popeye as a total flop, but if we can believe IMDB, I remembered incorrectly. With a budget of $20 million, it took in $49 million at the US box office. That didn�t make it a smash, and since the studio touted it as a big flick for the Christmas season, it became a disappointment. Still, it made money, even though I think the critics largely savaged it. Altman�s take on Popeye apparently reflects the original comic strip rather than the better-known animated shorts. Altman makes sure we know this from minute one; Popeye starts with the traditional opening from the Max Fleischer shorts except that the title character declares he�s in the wrong film. From there we receive an introduction to the quirky seaside burg of Sweethaven. Popeye the sailor man (Robin Williams) comes into town but receives a very chilly reception from the locals. 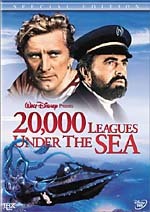 He arrives there to find his long-lost Pappy, and he rents a room from the Oyl family. There he meets Olive (Shelley Duvall), a stringbean about to become engaged to local leader Bluto (Paul L. Smith). Popeye and Olive react antagonistically toward each other, though we all know where matters will eventually lead. At their engagement party, Olive rethinks her decision to marry the brutish Bluto and she flees her home. Along the way she bumps into Popeye, and while they chat, they find a basket with a baby in it. They take in the child as their own and name him Swee� Pea (Wesley Ivan Hurt). After Olive jilts Bluto, he uses his authority to tax the Oyls to an extreme. This leaves them almost without a home, so her brother Castor (Donovan Scott) enters a boxing match; if he wins, they�ll get a tax holiday and big prize money. Castor gets walloped, so the freakishly strong Popeye takes over for him and saves the Oyls. All seems to be well until the gluttonous Wimpy (Paul Dooley) takes the seemingly psychic Swee� Pea with him to bet on the races. During some confusion, the boy gets kidnapped. Popeye, Olive and the others need to find him and confront the predictable culprit. Along the way, Popeye just might find out what the heck happened to his Pappy (Ray Walston). The question will be if anyone cares what happens to Popeye, Swee� Pea, Olive, Pappy or any of the others in this mess. Despite its reputation, I recalled positive feelings toward Popeye. Granted, I�d not seen it since I was 13, but as I remember, I liked it back then. Unfortunately, those warm emotions quickly evaporated when this clunker entered my DVD player. Could the producers possibly have found a worse choice than Altman to direct this thing? I could see a Spielberg or a Zemeckis making something of the cartoon action, but Altman clearly had no clue how to bring the quirky world of Popeye to life. Instead, he substitutes forced whimsy for actual humor or charm. I knew I was in for a long ride when I saw the wacky character who spends the whole movie attempting to pick up his hat; instead, he constantly kicks it a few feet in from of him. The whole town of Sweethaven feels like a refuge for circus acts � and lame ones at that. Though never advertised as such, Popeye actually offers a musical, and quite possibly the crummiest one ever filmed. Okay, that seems a little strong, but I have to wonder how much time composer Harry Nilsson put into the insanely simplistic songs. With titles like �He�s Large�, �I�m Mean�, and �Everything is Food�, it sounds as though Nilsson spent a good 15 to 20 minutes on the material. Some may argue that a movie based on a cartoon should feature basic tunes like these, but I think the songs of Popeye take things too far. The fact that Altman really comes to depend on the musical numbers after a while doesn�t help matters. The final act feels very padded with all the lame production pieces. At least the final third vaguely attempts a plot; the preceding parts of the movie simply present silly escapades connected by no apparent theme. Not everything about Popeye is bad. At least most of the actors give it their best shot. 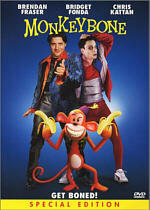 Their performances don�t help make the movie watchable, but I guess that the flick could have been worse in theory. However, only in theory could this movie seem less amusing, charming or entertaining. A thorough dud, Popeye offers a pretty terrible piece of work. 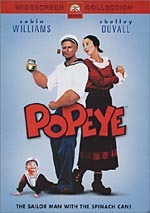 Popeye appears in an aspect ratio of approximately 2.35:1 on this single-sided, double-layered DVD; the image has been enhanced for 16X9 televisions. Despite a few issues, Popeye mostly looked good on DVD. For the most part, sharpness seemed positive. Some edge enhancement created a few concerns in that regard, as the occasional mild haloes made the picture moderately soft in wide shots. However, most of the movie was acceptably crisp and well defined. No concerns related to jagged edges or moir� effects affected the presentation. Given the moderately advancing age of the film, print flaws seemed modest. Periodic examples of speckles and grit cropped up, but these were reasonably rare and unproblematic. The palette of Popeye varied from subdued to dynamic, but the DVD replicated the hues quite nicely at all times. When appropriate, the colors looked bright and rich. The tones were vibrant and detailed, and they lacked any concerns like bleeding or noise. Black levels looked dense and deep, and low-light scenes presented good accuracy and clarity. The mix of defects knocked Popeye down to a �B+�, but I remained fairly impressed with the image overall. The Dolby Digital 5.1 soundtrack of Popeye also worked surprisingly well. When one considers that many flicks from 1980 remained monaural, the soundfield seemed broad and involving. Music showed fine stereo separation and imaging for both the songs and the score. Effects appeared accurately placed across the front spectrum, and they meshed together cleanly. The track also involved a smattering of localized speech, and some of those occasions worked nicely, such as the scene in which Popeye walked from left to right and his voice moved smoothly along with him. Overall, the track created a good sense of atmosphere, and some of the cartoonier bits came to life well. Fights offered nice elements from the side, and a few scenes brought the surrounds into the action as well. The rear speakers didn�t play a major role in the proceedings, but they were more active than I expected for a film of this vintage. Music provided most of the elements from the surrounds, but a few sequences brought the back channels into the film. I even noticed a little split-surround material, such as when a character flew from the front to the rear right. Audio quality mostly sounded fine. Probably the track�s biggest weakness stemmed from a preponderance of bad dubbing. From what I understand, most of Williams� original dialogue was inaudible as recorded, so he needed to do a massive amount of looping. This fact became abundantly clear as I watched the movie, for Williams� lines often blended poorly with the action. Some other dialogue � mostly Bluto�s � also demonstrated weak dubbing, but otherwise the speech seemed reasonably natural. I noticed no issues due to intelligibility or edginess. The rest of the track was quite good. Some light distortion greeted a few effects, but they mostly sounded acceptably accurate and distinctive. Bass response worked really well on some occasions, such as Bluto�s roar of anger when Olive jilted him; not only did that bellow fill all five speakers nicely, but also it rocked my subwoofer with surprising vigor. Music seemed clean and vibrant and also showed pretty nice range. Although the audio of Popeye didn�t match up with modern tracks, it seemed very good for its age, so I gave it a �B+�. While Paramount did a nice job with the picture and audio of Popeye, unfortunately they didn�t feel it deserved any supplements. Absolutely no extras appear on this DVD, as we fail to find even the film�s trailer. That�s too bad, as I�d really like to hear the perspective of Altman and others about this movie. I don�t intend the last statement to be ironic � I�d truly feel interested to get an explanation about how so many talented people could make a movie as genuinely atrocious as Popeye. Unfortunately, that question will remain unanswered, and we�re simply left with a nearly unwatchable movie. At least the DVD boasts very good picture and sound, even though the package omits all extras. Fans of Popeye will like this DVD; despite the absence of supplements, with its low list price and positive visual and audio quality, it should please the film�s partisans. Others with less than a heavy allegiance to Popeye should stay away from this dud.